Love it. Fits perfect. I would recommend this jacket to anyone. That is the best coat I have ever had it keep me warm in 25 degrees , wind proof and stay dry. Big front pocket are nice. This jacket fits great! Keeps me warm and dry. It does run big. I typically wear a large but could have done a medium with this jacket. But the large gives me plenty of room to wear a hoody underneath if I need to. Bought this coat about 2 months ago, extremely comfortable. Bought it for a business coat to have a patch put on it. It is very warm but still light enough for a cool day. Greatest work jacket i ever bought. i bought the black one about 4 years ago and it is still going strong. Very warm with a heavyweight hoodie in 10-20 degrees weather in nyc winter. So nice i recently ordered the grey one. Looks and feels great. We have been having some severe cold and wind here in Iowa and it has kept me very comfortable. I only have one problem and that is with the zipper. You have to really seat the zipper down in the slot to be able to zip it up. One of my favorite Carhartt purchases to date. This jacket has an updated style, great fit, warm but not heavy, and still has that Carhartt quality and durability. Looking into purchasing another in a different color. Thank you! Just got the jacket recently. The length of the sleeves are nice for 2xl tall, however the length of the jacket could be a bit longer. I am 6'8" and it is hard to find jackets that are long enough. So far I am happy with my purchase. Great work coat. Highly recommend. Great jacket. I purchased the XL - Tall, which gives me enough room to comfortably wear a hooded zip-up sweater underneath the jacket. when I am not wearing the hoodie beneath the jacket it fits well, and I am still warm. Swear by Carhartt brand. Always had good luck with their clothes and boots. Bought for my son, he is very happy with it. He is skinny 5'9" so the Small works for him. He particularly likes the fact that the outside cloth is not as stiff as the classic Carharrt. On the minus side: the filling could be a bit thicker (and warmer) and he does not like the zippers for the hand pockets, they chafe . It's perfect for what I wanted it. Have another one that's great for the cold weather and rain, but I needed one with no hood for riding motorcycle and this jacket is perfect for it. The raised collar and the enclosed ends of hands allow no cold air to get in. Love the jacket. Great fit. I bought for my husband. He just love it. Love it! My new favorite jacket! Love my new Carhartt jacket! Carhartt owner for years. Bought this jacket for everyday work in fridge climate and outdoor. Love the high neck to keep the wind off, wish this style's came in a 3x tall could be a bit longer on the torso. New it's still a little stiff, gotta break it in. Great jacket! Keeps me warm on cold days and dry on wet ones. Looks great on and off the job sites. Plenty of pockets, and warm ones for the hands. Took a tumble and a steel post snagged it and had a very small tear but true to Carhartt quality tough as nails, its in great shape and tear is not expanding, still looks great. Ended up buying a few different colors, definitely not disappointed. I bought this jacket for my husband and he loves it! We both really love the navy blue color, and it fits true to size. My husband said he also really likes all the pocket space - the jacket has 6 pockets! We live in Va. Bch Va. so the weight of the jacket is perfect for the temps. in our area. Great quality! My husband loves it. He is 6’1” and weighs 210lbs. He normally wears a size XL, but sized down to a L for this jacket. It is still roomy on him but not enough to go to a M. He wears it daily on our property in Texas! I am 6' 185lbs and this is one of the best fitting and overall jackets I have owned. A big issue I have with other Carhart jackets is that they are too short, I do not have that problem with this jacket. The coat had great potential. It was just what he was looking for..except it didn't have a hood. For that reason I returned the item. Really like this coat. It looks a little nicer than a typical Carhartt duck coat or hoodie, but still is durable. The other comments about size are correct - it runs large. I am 5’10” and 175 and a small fits. It is a little snug but not too tight. I think a medium wouldn’t work for me. Great and very comfortable and warm. Great jacket, fits perfectly and looks good! A nice lighter weight water resistant jacket. This jacket is one of the few models approved for our company work jackets. This is a great jacket with the exception of the tricky zipper. It is very hard to get started. You do not need a double zipper for this type of jacket and am sure that is the problem with the zipper. This problem has been reported by many reviewers and is hard to believe that Carhartt has not fixed this issue yet. If it isn't repaired by the time I need to replace my jacket, I will not be buying this model again. That would be too bad, because the jacket is perfect for my needs, but who wants to struggle with the zipper every time they put on a jacket. Please feel free to contact us at 1 800 833 3118 if you need assistance. I love the jacket. Not the warmest. But it is worth what you pay. perfect for my tall 22 yr old son! stylish, and the tall covered his body nicely and long enough in the arms. I ordered the blue and red striped hat to go with the navy coat --- sharp! The jacket is the best jacket I have ever owned I have another one that I have had for several years and love it just had to buy another before they quit makeing it. Nicely made. Fit as expected. Unexpectedly warm in the cold. Comfy in cool weather. Rain resistance quite effective in light to moderate rain. Should hold up well. My everyday go to jacket! Over the last year and a half this has been my go to jacket! I always opted for a down winter coat, but switching to the Jefferson Traditional has been a smart decision. Not only do you get the advantage of Carhartt durability, but the Quick Duck fabric helps me to cut down on the weight and bulk. The jacket has plenty of room to move around and work, while still being able to layer a sweatshirt for the -0 days. You can't go wrong! Great jacket fits great very durable! This is a great jacket it is stylish enough to wear on a winter tour of Washington D.C like I did but yet tough enough to wear at the paper mill in the South East my favorite go to jacket when it gets cold enough. It is great to see the we can sell great things in America. I am a walking advertisement for this company and proud to be. I will volunteer to be a test subject for your gear at anytime. Proud owner of two years. I love it so far. Warm and the fit is perfect for a 6’7” guy. I bought a XLT and got the brown which I like. I would recommend this jacket. It is a little rigid otherwise it is good. Warm and rugged coat. Fit is slightly larger but still comfortable. I like how the material is much softer than your standard materials that I am used to from Carhart. You can actually move freely with this Jacket. Which is the back length for XLarge regular ? BEST ANSWER: The back length will be 31 inches for a size XL. Is the black fabric of the Jefferson pre-washed in appearance, like the other black Duck canvas jackets? Does the quick duck fabric fade at all? BEST ANSWER: I think it depends on your application of the coat. If you're outside 10 to 15 hours a day throughout all the seasons, you'll probably have some fading, but just to wear it to and from a building, there wouldn't be much. Also just normal washing doesn't make it fade that I can tell either. I think it will fade, but it looks good. It has not faded. Quality and color retention are outstanding. Not yet. One year in and no fading. Why no option for a hood ? BEST ANSWER: We apologize that this style does not offer a option for a hood. We will forward your suggestion to our Product Design Team for future consideration. Can you wash this jacket? BEST ANSWER: Yes, as long as you follow the care instructions: Machine wash cold, Non-chlorine bleach when needed, Tumble dry low, Do not iron, Do not dry clean. One of the labels that came with the Jacket indicates "convenient media port;" I can't find it. Could somebody point it out to me? Thanks! BEST ANSWER: This style will not have a media port. We apologize for any inconvenience. Does the quick duck Jefferson traditional have a longer back than front? BEST ANSWER: Yes; it features a drop tail. Does this Jacket fit similar to the Jefferson? BEST ANSWER: These two styles will have a similar fit. BEST ANSWER: As long as you choosing the 2XL and not the 2XL Tall, you will be choosing the 2XL Regular. I have friends that bought this jacket last year (2017) in blasé orange but I cannot find it anywhere. Is it still available in that color and where would I find it? BEST ANSWER: The orange color has been discontinued and we no longer have any stock. You may wish to do an online search to see if another retailer has any left. I am 5’10” 190 lbs. I wear slim fit shirts and a large in most jackets and a 43 in a suit jacket. What size should I get? BEST ANSWER: If your chest circumference is 43" around, that falls within the large category. However, to best advise you, we would need your waist measurement as well. does this jacket come in olive ? BEST ANSWER: It does not currently come in olive. What are the dimensions of the front chest pockets? BEST ANSWER: I don’t have the jacket with me but they’re about 5-7 maybe a bit bigger and large enough to carry a small note book, wallet, glasses case, etc. Love the coat, where it all the time, looks new. Where is the jacket made? BEST ANSWER: This jacket is made in Mexico, China, and Bangladesh. Is there a version of this jacket with a hood? BEST ANSWER: This features an 80g Thinsulate lining for warmth without bulk. It will provide warmth, but will not be as warm as the arctic quilt lining in the C55. This is a bit shorter in length than the C55 and has some different cosmetic features as well. Both products are water repellent. How does it do with sparks?? BEST ANSWER: We don't recommend that you use this in an environment where it would be exposed to sparks. is this jacket warmer than the quick duck rockwall 3 in 1? BEST ANSWER: We do not temperature-rate our garments, but the Jefferson would be considered warmer than the Rockwall. Why cann't Carhartt make this jacket and other popular styles of men's coats and jackets for women?! As a woman who works outside in the elements I want a heavy duty material that can stand up to the task and keep me warm while doing it! I shouldn't have to settle to look frumpy in a jacket designed for men to achieve this. Is there drawstrings to this jacket? Yes at the bottom left and right of the jacket. I was wondering how this jacket does in the wash as far as shrinkage? I notice people saying it runs big and have to get a size smaller than usual. BEST ANSWER: Our jackets are true to size and should not shrink more than 2-4% throughout the life of the garment as long as the care instructions are followed. "I ordered my regular size (which is probably larger than most would like) and I'm very pleased. But I prefer a loose fit so that I can wear my Carhartt insulated vest if necessary. I have not washed mine, but with the material it is made of, I don't have any concern in that area. It sheds water very well and is a great Jacket." What is the equivalent of this jacket in womens? BEST ANSWER: The closest would be the Cryder (102246). Please note, it does feature a hood and the 101492 does not. I have no idea of the equivalent but it is the best carhartt jacket that I have ever owned. I have a black carhart RAIN jacket that is heavy, has a mesh lining, has a zippered exterior chest pocket and hood. What style is this jacket?? I wish to purchase another as a gift! I can't tell what carhart rain jacket I have and I wish to purchase one as a gift . It is black, heavy, mesh lining, exterior zippered chest pocket. They make bib overalls to match? I have a 45" chest and a 49" waist will a 2X fit me? I have a 49" chest and a 47" inch waist (measured around the belly button area) and an XL was too baggy looking on me in the stomach area. I wrote a long review on this jacket so please check it out. BEST ANSWER: We do not advertise it as wind-resistant, it will help to protect you from the elements. Yes very good against the Mi. Winds. Very warm. Sorry Gerry, I bought this for an employee, but I can tell you that this is the second one he bought, and we work at a Cold Storage. Yes, extremely wind resistant and I used to live in San Diego... wear it on the pier! Yes! I ended up buying another for my son. Why do you not make 3XLT? BEST ANSWER: We apologize this style is not offered in 3xl tall. We are happy to forward a suggestion to our Product Design team. Is this jacket as warm as the Bartlett jacket? BEST ANSWER: The linings are very similar in warmth. However, Thinsulate may be considered slightly warmer. Honestly it's not. It is warm, but the Bartlett jacket is warmer and if you're looking for warmth I would get the Bartlett jacket. Looking for your warmest jacket with a zip out lining. Do you make one like this? 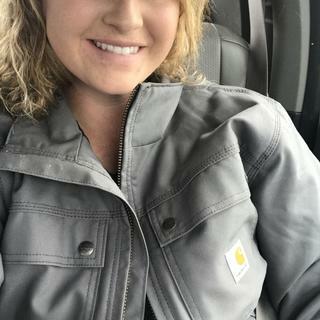 This jacket doesn't have a zip out lining but it is very warm and now my favorite carhart jacket! Where is this coat made? BEST ANSWER: This style is made in the US and Bangladesh. If you are looking for fit of the jacket, I can tell you it runs true to size on the fit. Well made jacket of quality components, and keeps me very warm. Bangladesh! Very satisfied with coat very warm.